Know the position/company thoroughly, as well as how your skills relate to the position/company. You can research companies by visiting their website or LinkedIn/Facebook/Twitter account. Prepare answers to common interview questions (do a Google search for questions). Prepare questions to ask the interviewer. Participate in a practice interview with the Career Center. Utilize our online system, InterviewStream, from home. Prepare a positive spin on any potential negatives in your candidacy. However, instead of making excuses, redirect their attention to other activities/skills that will alleviate their concerns. For example, if you are lacking related work experience, discuss your skills gained through school projects, organizations you're a part of, or volunteer work. Consider developing a portfolio to highlight your accomplishments. Prepare a cheat sheet for the interview with name/title/department of the interviewers, notes about your qualifications, and questions to ask the interviewer. Needed materials: pen, notepad, appointment book/calendar, and multiple copies of your resume (and possibly cover letter and reference list). Types of Interviews: Telephone, Web (i.e. Skype), On Campus, or Traditional (one-on-one or panel at company location). Dress for success! Visit our guide on Interview Attire. STAR = the Situation you faced, the Task you completed, the Action you took, and the Results you achieved. Interviewers are typically looking for these three components in your answers. This method is critical for answering behavioral questions and can be used for other types as well. Details are extremely important. They are what separate you from the next applicant. Not going in depth is one of the biggest mistakes that candidates make. All of their questions, no matter how straightforward or off the wall, are in relation to the position. So all of your answers should take into account how each question relates to the position. If possible, create a back-and-forth conversation instead of just answering question after question. 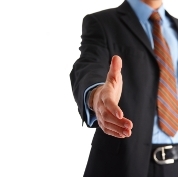 Form a real connection by making it enjoyable for the interviewer. Avoid long rambling responses. A clear and concise answer allows the interviewer to focus on what is truly important. Always focus on the positive. Talking badly about a previous job or boss reflects poorly on you as an applicant. Even if you're a reserved person, it's important that you demonstrate your enthusiasm and confidence. Be aware of your body language. Sit back in your chair with good posture, and lean forward to show interest when appropriate. Use good eye contact - looking away too often makes you seem unconfident. End on a positive note, possibly by summarizing your interest in the position. Then, establish the next step by asking when they expect a decision to be made, and if there is anything additional you need to do. I see on your resume you have experience in _________ can you tell me more? Tell me how your time at UNCW has prepared you for this position. Need more questions… use Google to find specific questions related to your industry! What are the main objectives that you have for this position? Describe the typical first assignments. What is your organization's culture? What do you enjoy/dislike about working here? What characteristics does a successful person have at your organization? Will there be opportunities for increased responsibility and broader experience? How will I and how often will I be evaluated? Who does the evaluation? 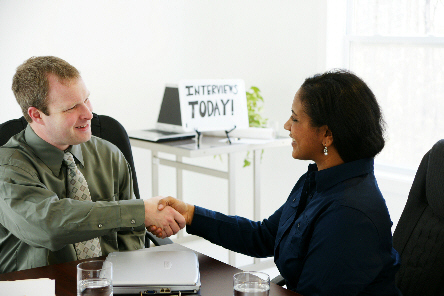 More and more companies are conducting online job interviews. These interviews save employers money, because they do not have to pay for a job fair or for candidates to travel to the office. In addition, the technology needed to conduct online interviews has become mainstream, so it is a simple and effective way to interview candidates for employment. For job seekers, it's easy to interview right from home. It saves on travel time and video interviewing, if you prepare in advance, can be less stressful than interviewing in-person. 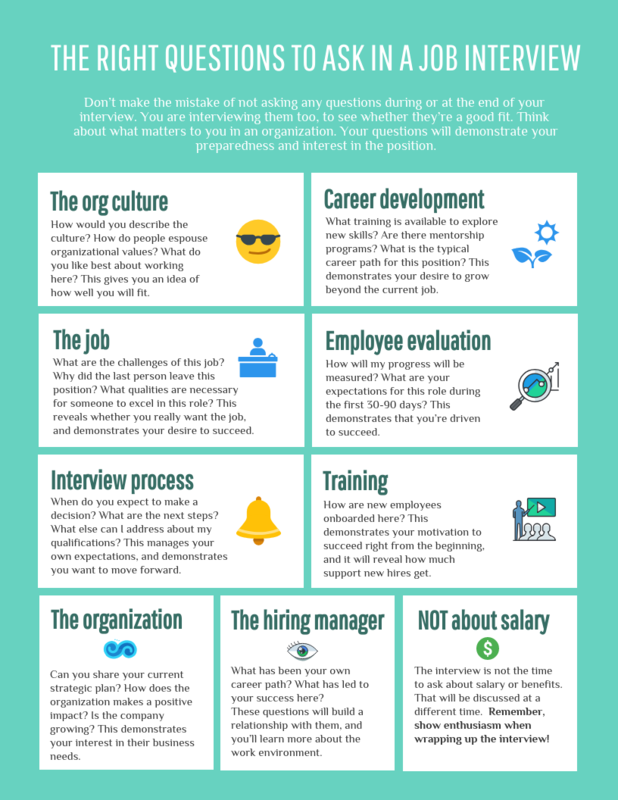 Here's information on the different types of online job interviews and how to best practice and prepare for the interview. Remember that online interviews are just as important as in-person interviews. Your interview could get you to the next round of job interviewing or even a job offer if the company handles all the interviewing online. Here's how to get ready for your interview. Practice, practice, practice! You can use BigInterview to practice! Test your equipment before the interview to make sure it works! It was a pleasure interviewing with you on (Date) for the (Title) position. After discussing all of the positive attributes about the position, I am even more interested in working at (Company). I was particularly interested in (specific aspect of the position/company). In addition, I was excited to hear about (another aspect of the position/company). Please contact me at (910) 123-4567 or at abc123@uncw.edu if I can answer any further questions. Thank you for your time and consideration.